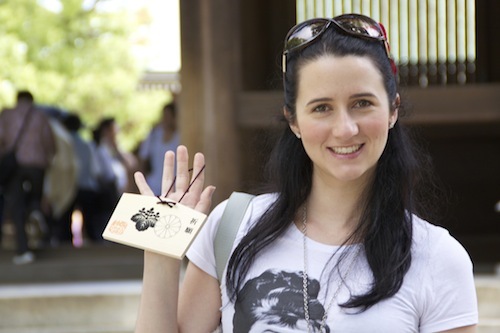 This picture is of me whilst we were in Tokyo, visiting the Meiji Shrine. Adam first posted it on Facebook, when we were still in Japan, as part of a small Japan 2012 album. The first comment was from Lady Mausey - "You look soooo happy you make me happy looking at you. love you xxxxxxx". Yes, my Nan is totally Facebook capable. The photo then gained a big reaction, of beautiful compliments from family and friends, when I put it as my profile picture. That photo, is extremely sentimental to me. Mausey was right I was on holiday with my wonderful husband, having an amazing time. I was soooo happy... but at the same time, right at the moment the photo was taken, believe it or not - I was fighting back tears. That wooden board in my hand is a Votive Tablet. 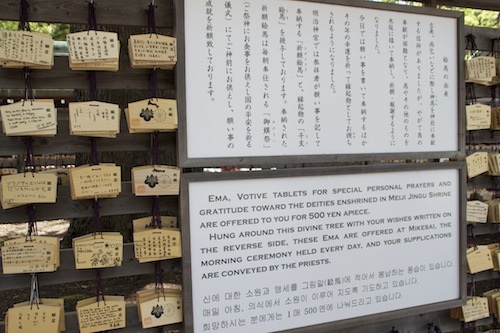 "Ema, Votive Tablets for special personal prayers and gratitude toward the deities enshrined in Meiji Jingu Shrine are offered to you for 500Yen apiece. 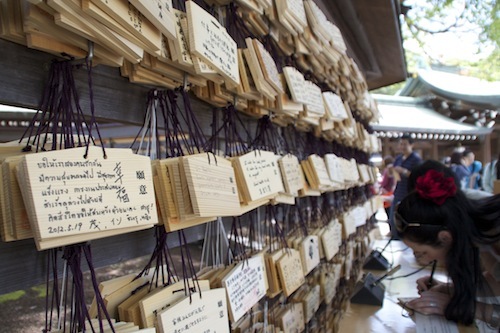 Hung around this Divine Tree with your wishes written on the reverse side, these Ema are offered at Mikesai, the morning ceremony held every day, and your supplications are conveyed by the priests." It is one thing to know what is making you so heartbroken, it is a harder thing to write it down. With an unsteady hand and tears in my eyes... 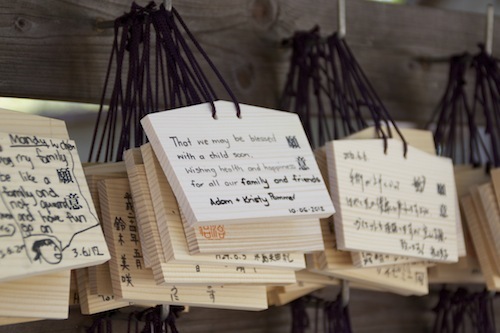 I wrote our wishes down and hung them under the Divine Tree. "That we may be blessed with a child soon. Wishing health and happiness for all our family and friends. Adam + Kristy Pommer. 10.06.2012". It has been no secret throughout my blog posts that Adam and I have been having fertility issues and enduring the heart-wrenching process that is IVF. I'm an over-sharer by nature. I can't help it, it's who I am and it helps me to cope. 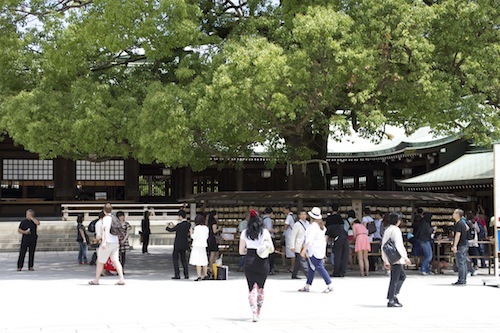 When we returned from Japan, we had an appointment with our IVF specialist to begin preparing for our next transfer, which was to start on Day 2 of my periods. Day 2 never came. Instead, this happened. I had gotten into the habit of doing pregnancy tests every month around the time that my periods were due. It was a way of being prepared for the disappointment, in a controlled environment. I would always do them when Adam was home so I could get the cuddles and love I needed when the tests were negative. The morning of the 29th of June, I woke up with a full bladder and a husband who was at work. 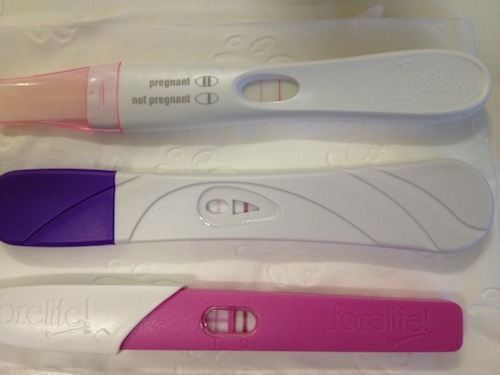 For the first time ever I did a pregnancy test on a whim - without Adam at home. For some reason I just decided I needed to do one. I nearly fell over when the second line came up. Obviously, I found it so difficult to believe that I did three for good measure. 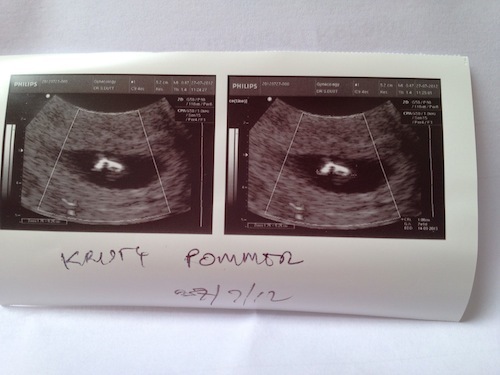 For the second time ever we were pregnant, and it was by natural means! I was excited and terrified all at once. I snapped the above photo and texted it to Adam and eagerly awaited his phone call whilst pacing around the house. When he called, he was feeling the same as me. Excited. Scared to believe it. Terrified it wouldn't last. We'd been burnt before. We knew our medical situation, we knew our odds. We had already had our miracle natural pregnancy that sadly did not last and broke our hearts. We had transferred four textbook perfect embryo's with zero success. Yet somehow, against the odds, we had managed to come home from our holiday with a stow-away. I popped the tests into a zip-lock bag and headed to my Mum's house. When I got there Mum was still in bed. I climbed in beside her, and without looking at me she asked what I was doing. "I'm going to Brisbane to see Emma and Elisabeth and their babies." "Have you got your periods yet?". Her face was still buried in her pillow. "No. But I have these." And I threw the ziplock bag beside her on the pillow. With that - her head was up, her eyes were open and she was scrambling for her glasses whilst promptly bursting into tears. The last time I told her I was pregnant, she was on an overseas holiday and we had lost the baby before she had made it home. It was so wonderful to be able to see her reaction in person this time around. When we managed to pull ourselves out of bed, we walked into the lounge room to find my little brother Jonathan - who asked for the day off school. Mum's reply to his request was something along the lines of "Well there is about as much chance of that happening as your sister has of being pregnant." Jonathan was stunned, he thought Mum was being harsh to his poor infertile sister. Lucky boy got the day off school thanks to my good news! I called the IVF clinic. They organised blood tests to confirm. Yes. We were absolutely pregnant. I had a bit of a freak out at 8 weeks, thinking again that it was all over for me. I just stopped 'feeling' pregnant and got the horrible thought in my head that it was the same as last time, and as a result - had myself in an absolute state. Thankfully my Obstetrician was able to fit me in for a quick scan, and reassure me that everything was ok, my baby was still there. It was still growing and it's heart was definitely beating. 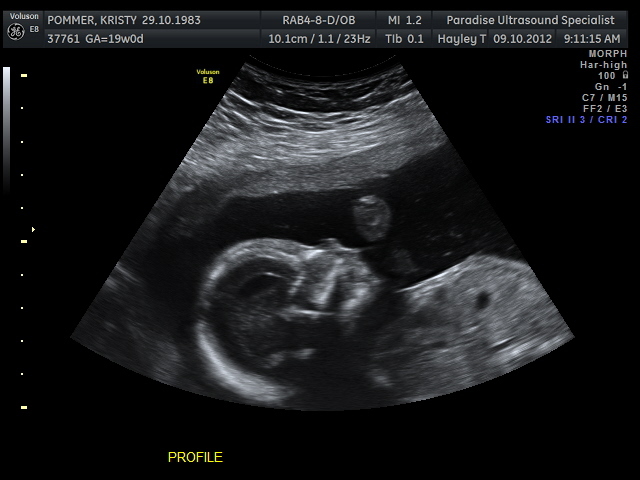 When Adam and I had this 10 weeks and 6 days scan, I asked the Obstetrician whether that was the head at the bottom and just as I had finished the question - the gorgeous little creature actually swam around and did a little flip in front of us. I was amazed, but most of all I loved seeing how much it blew Adam's mind. He had no idea that they moved around like that. We had been watching the Olympics and we quickly claimed that our child was going to be an awesome diver. 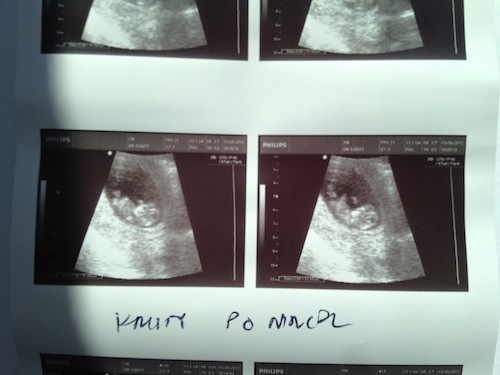 We are due March 5th, 2013. So that makes us 37 weeks exactly today. We actually didn't. We just chose not to announce it on Facebook. With everything that we had been through fertility-wise we just weren't keen to put it out there that way. It took a very long time (far longer than the 12 week mark) for us to believe that we would actually end up with a baby in our arms. It is necessary for me to tell my work immediately, so that I can be removed from working in areas that require X-ray and substances that are thought to cause birth defects and/or increase your risk of miscarriage. It's not worth trying to hide it. It could never be a secret. We simply enjoyed telling people when we saw them. And as time went on we were surprised to realise how many people didn't know! It was not intentional, it was just the way it played out. I'm old-fashioned. I love surprises. And in my eyes, this is the best surprise you can ever experience. Adam would have liked to find out, and often teased me by pretending to look when the Ultrasound technician said to turn away... but I used the "It's inside me. I win!" move and hence - a surprise it is. I just this moment asked Adam "Do you mind that the baby is a surprise?". And his answer was "No. I love it. I'm really excited about the surprise now." 'I told you if you just relaxed/went on holiday/forgot about it you'd get pregnant'. This is a statement that Adam and I have heard a lot. And whilst we know your words are well-intentioned - they can frustrate us deeply. If you think we didn't think about wanting-a-baby or trying-for-a-baby while we were away... you are so wrong. We want it too bad to simply forget it or give up on it. It's not that easy. Our wish on the Votive Tablet above attests to that. But we absolutely thought about it, and spoke about it every day of the trip. There was too many cute things that we wanted to buy (or win in a skill-tester), for a baby that was to our knowledge, not yet on it's way. We did end up spoiling ourselves with a select few items to bring home, and can't wait to put them in the nursery. We knew that our chances of falling pregnant naturally were slim-to-none, but we also knew that when there is sperm involved there is always a chance! Of course we hoped it would happen. But we did not believe it would happen. 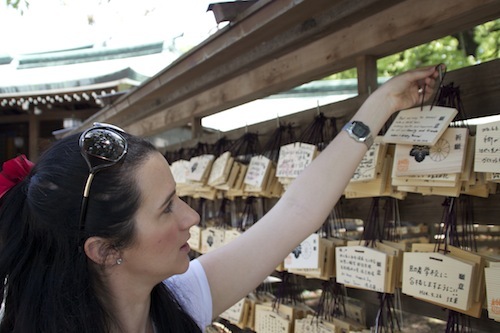 I was definitely thinking about our chances of being pregnant when I was in the 'onsen' during our stay at Kyoto. At Adam's request we bathed one night in a traditional Japanese public bath house. The men's and ladies sections are separate. The water in the bath was ridiculously warm and I remember sitting in there thinking about our chances. You see, I knew it was close to ovulation time - though its hard to tell exactly after being pumped up on drugs for an egg collection cycle. Having done IVF previously and having been told not to swim or bath or overheat myself for 2 weeks post having an embryo transferred, I couldn't help but think to myself as I sat there in that hot bath - that I had murdered any chance for a holiday baby right then and there. From my personal experience, when you are going through IVF - it helps none - to be told that you just need to relax and stop thinking about it. Comments like that make you realise how much the people who haven't experienced it, just don't understand what you are going through. As I said before, the thoughts and words are well intended, but it's not what we want to hear. We want to hear that you think our situation is unfair, but that you hope we will have success soon. We want to hear that you understand that we are terrified that it may not happen for us, but that you believe it will happen - because we are the sort of people who should be parents. We want to hear that you will support us in our efforts to create our own family, and not speak of them as if we are simply over-reacting. 'So many people fall pregnant when they stop IVF'. For the sake of other people who are enduring the emotionally tumultuous roller-coaster of IVF, I have to take a moment to fight this perception. Everyone has heard of someone or personally knows someone - who was having IVF and fell pregnant when they stopped/gave up/went on holiday etc... But what you don't hear about is all the people who try for years and years on end. Those people who try and never succeed. Trust me, there are plenty of them. I now know a lot of them personally and understandably the majority of the people who don't succeed - keep very quiet about it. They still go on holidays. They get drunk. They choose to stop having IVF, and they still don't end up pregnant. We fell pregnant on holiday. We are not the norm. Do you finally believe it is going to happen? Being a nurse, I am far too aware that it's not truly yours until it's safe in your arms. But I also know that the odds from now are ridiculously good. This baby should be ours to keep. It was only a month ago that I finally let myself into the baby section of Target and beyond. I need to watch myself. We may have unleashed a monster. So YES! I finally believe it. I LOVE and APPRECIATE every second of being pregnant. It's everything I have ever wanted and more. I have never smiled so much or felt so content. Right now, I am sitting in the lounge and the baby is rolling around underneath my swimmers and has the hiccups. It is truly the most wonderful thing in the world. Have you finished the nursery? Ummmm... To be honest. No. We're currently living at my parents. But you have 3 weeks until you're due?!?! Yeah. There's a story to that. The reason, is also why I dropped off the blog-o-sphere for so long. But that's another post for another day. We have a lot of catching up to do. Show me a picture of your baby belly! As long as I don't go into labour in the next few days - I promise there will be a photo-filled post of the evolution of my baby belly.